It might seem a strange time of year for lemon cake but a recent trip to Cornwall reminded me how good they are. I’d never been to Cornwall before but having been I’d love to go back. 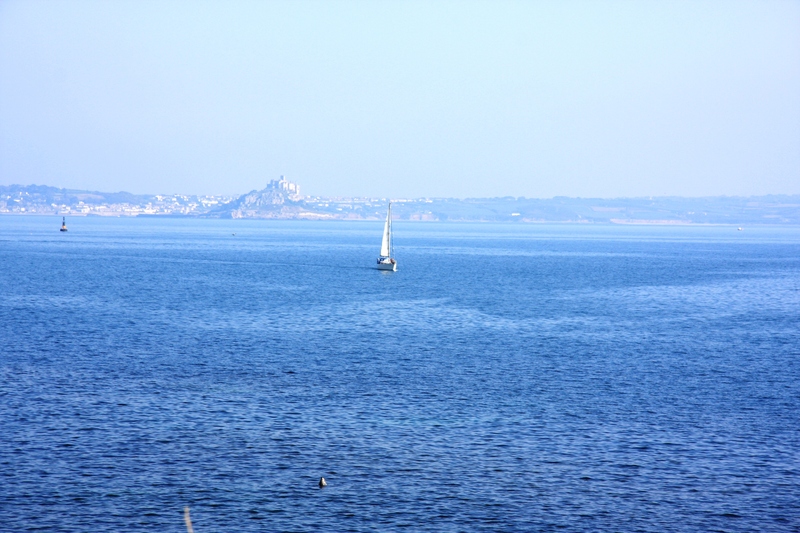 We stayed in Penzance and managed to visit Lands End and St Ives as well. The whole area is beautiful and if you ever need a Cornish pasty shop, St Ives is the place to go: there must be hundreds. (Something else now on my list of things to make). We spent most of our time enjoying the scenery, walking from one meal to the next. We walked along the coast from Penzance to Mousehole, the tiny village that the poet Dylan Thomas honeymooned in and called the prettiest village in England. We found an amazing little café called the Rock Pool Cafe which overlooks a large pool in the rocks and out towards the open sea as well as along the coast to St Michael’s Mount. While we sat there eating our lemon cake and drinking our coffee in the sun, a seal played in the water: it really couldn’t have been any better. You can just see the seal in the foreground of the photo. It was the beginning of October and we had a couple of days with beautiful summer weather. The third day was cold, windy and foggy, which gave a completely different perspective on the region and we walked from Lands End down into Sennen Cove. Where we had coffee and a slice of lemon and blueberry cake: something I will be remembering to make next summer! So I was really just looking for an excuse to make a lemon cake with lemon curd and cream and my parents coming to visit seemed like the perfect opportunity. I had four lemons so I put two in the cake and then used the other two for the lemon curd. I wanted a recipe that didn’t give me any leftover egg whites so I used Delia Smith’s and scaled the recipe down: instead of four eggs and four large lemons I used one egg and two medium-ish lemons. It gave me enough for the cake filling with some left over for lemon curd on toast for breakfast. You could scale my version up to make extra, or visit Delia’s original recipe here. 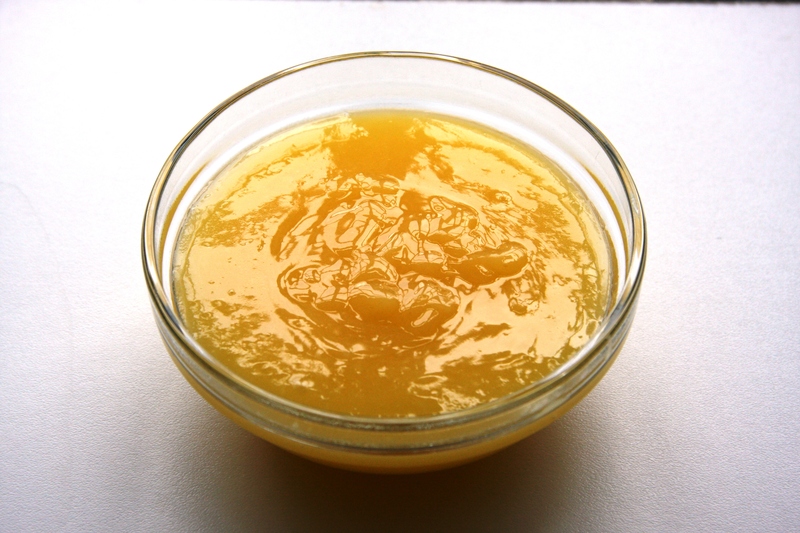 Alternatively you could use store-bought lemon curd. Set the oven to 180ºC and grease, and line the base of, two 8″ sandwich tins. Add the eggs, one at a time, and mix until properly incorporated. Sieve in the flour and fold in carefully. 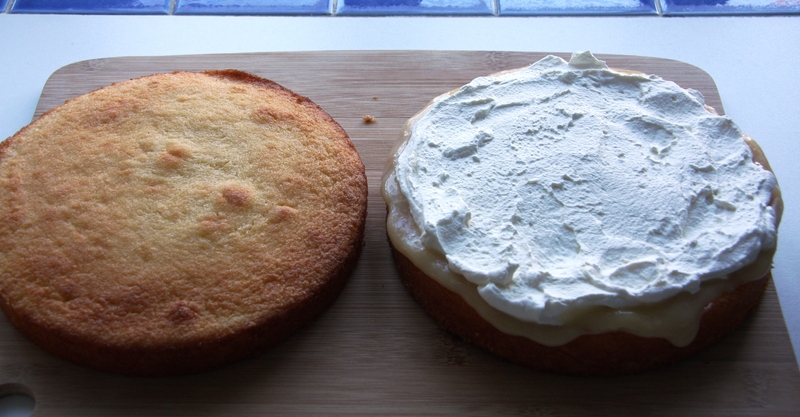 Divide the mixture equally between the two cake tins. The combination of the raising agent and the lemon juice gives the cake mixture an almost “fizzy” appearance but this is nothing to worry about. Bake for around 20-25 minutes, until firm to the touch, well risen and golden. Allow to cool in the tins for a few minutes before turning out and allowing to cool completely on a wire rack. Beat the egg and chop the butter into cubes. 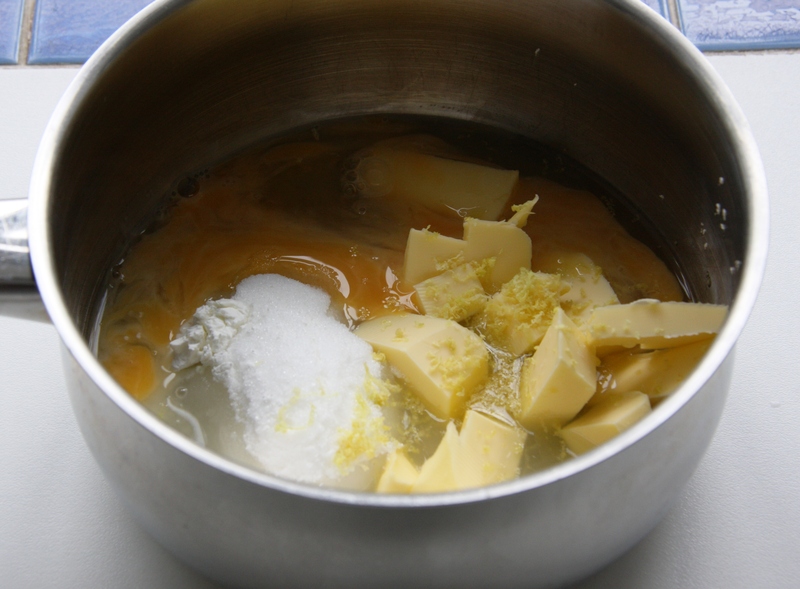 Put the egg, butter, sugar, cornflour and lemon zest and juice into a saucepan and heat gently, stirring all the time. The mixture will slowly start to thicken (it can be useful to use a small whisk at this stage). Do not allow the mixture to overheat as the eggs will scramble. Once it has started to thicken allow the mixture to simmer very gently for a minute, stirring all the time. It should coat the back of a wooden spoon. 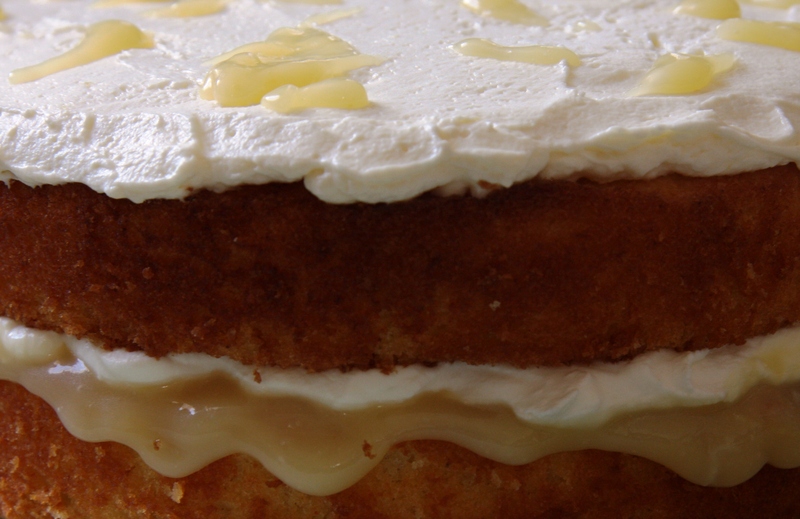 When the cake and the lemon curd are cold, whip the cream. 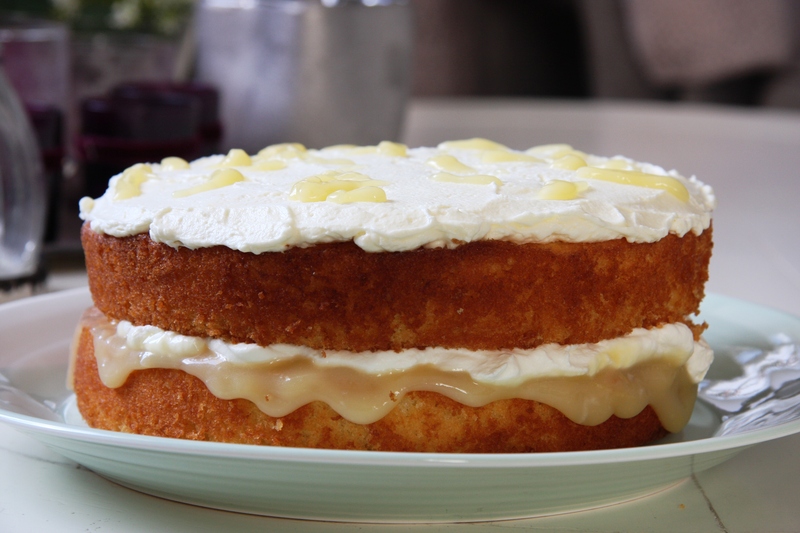 Spread a layer of lemon curd on one side of the cake and then a layer of whipped cream. Mix some lemon curd into your remaining cream, reserving some for decoration. Take care not to over beat the cream. 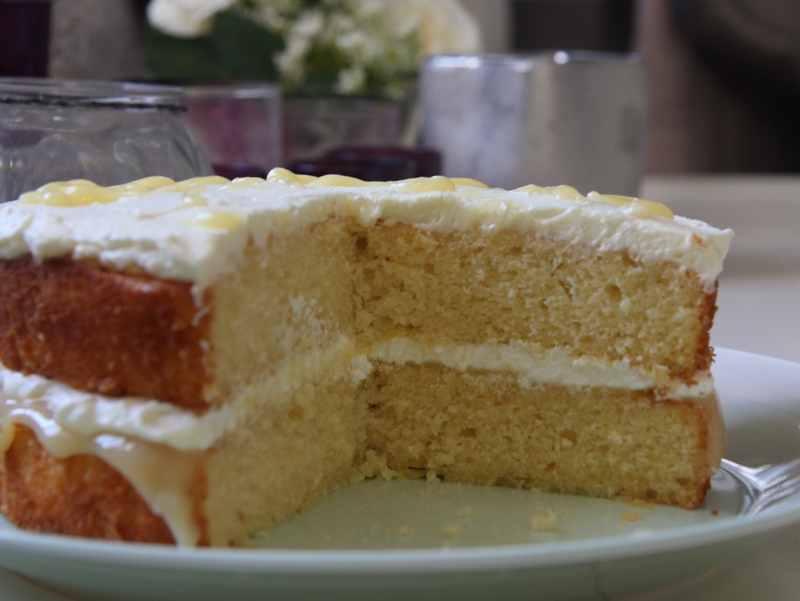 Spread the lemon curd mixture over the top of the cake and decorate with some of the remaining lemon curd. It’s a good idea to keep this cake in the fridge because of the cream: just take it out before you want to eat it to let it come up to room temperature. What a great cake; beautifully decorated. And I can’t resist lemon in a cake! So pretty. We spent a week in cornwall last year, mostly on the northern coast. So beautiful. And great seafood! It’s really lovely and I can’t believe it’s taken me so long to get there! Your weekend sounds wonderful! And your cake looks delicious!